Argentina English: Federer and his meeting with Diego Maradona: "He was more elated than me"
Federer and his meeting with Diego Maradona: "He was more elated than me"
Two giant wave. 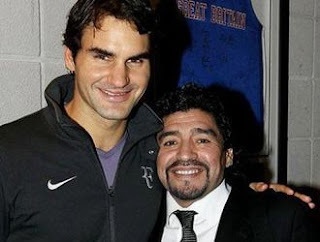 Far from the egos and full of admiration for the other, Diego Armando Maradona and Roger Federer had a meeting in London, where former coach of the Argentina national soccer team is visiting while Federer is playing tennis Masters Cup. Diego takes his life in England to see how much game there, football and tennis. After visiting with Carlos Tevez in the match between Manchester City and Fulham, the Ten moved to the racquet sport. "I heard he is a big tennis fan, a big fan of me. And I'm a big football fan. It was a pleasure to meet him," Federer told, and extended: "Maradona was ecstatic, almost more than me. It was very nice. " "They did not know English, we should appeal to a translator. It was different when I meet Tiger Woods, Federer plotted, a close friend of former world number one golf. "He said he would not be his last visit, I think it will come more often here, that's nice of you," Federer closed.